If you need to exit this page quickly, please click here. You are not to blame, it is not your fault, you did not choose for this to happen. Are you a survivor of child abuse seeking justice? When you put your trust in a professional to guide you through the process of seeking support, advice and ultimately gaining justice for the trauma that you have endured, it is essential to have the right person to understand you. Our team of specialist abuse lawyers at Ramsdens strive to achieve the best result possible for every individual client. We pride ourselves on being client-focused, understanding how upsetting it is to relive the abuse and remaining sensitive in our approach. Natalie Marrison is the head of the Abuse team for Ramsdens and has a team of focused staff delivering this service for child and adult survivors of abuse. Their wealth of experience includes advising and supporting claims for compensation of adult and child abuse. When deciding to discuss the abuse suffered, survivors will feel anxious and concerned about approaching others for advice. Questions that are common include: Will I be believed? Will the perpetrator follow through with their threats against me and my family, when they know I have disclosed the abuse? Will others understand that I still struggle with my feelings towards my abuser? Will others treat me differently when they know I have been abused? We understand the importance of empathy, acting with compassion and care for all survivors. The initial advice that we provide, is always handled with the strictest of confidence and with respect for your ultimate decision. We will advise on all concerns and legal issues. The team at Ramsdens has extensive experience in dealing with cases relating to many different types of child abuse. Investigating cases of abuse can be complex and lengthy and every person seeking to claim compensation for the injustice subjected on them will be treated sensitively and with care throughout their claim. Our team have acted for individuals and group actions, including complaints within the local authority, other public authorities and the Criminal Injuries Compensation Authority (CICA). Our team work with clients compassionately, listening to their experiences and treating each case sensitively. We understand how trauma can be a huge barrier for survivors of abuse and here at Ramsdens, we will endeavour to ensure that we provide our full support, signposting clients to relevant support agencies throughout the claim process, as well as handling the case with the strictest of confidentiality. Survivors of sexual abuse will be given anonymity during their claim, safeguarding personal details, preventing publication and therefore protecting identity. It is possible to make a claim for compensation even if the abuse took place many years ago. Our specialist team can advise you in confidence about this. We offer free advice in the initial stages of your claim with no obligation to proceed. You can change your solicitor during your claim, if you feel that you are unhappy with the advice you have received or feel that they are not a specialist in child abuse law. We are happy to offer you free initial advice on this matter and provide you with the options available to you. Should you feel that a claim you have already made with another firm, was settled at an unsatisfactory level or not dealt with properly, please do not hesitate to contact our team. You can also read more information on seeking compensation here. For more information, please contact our team today on 0113 887 1834 or text LAW to 67777. Alternatively, you can make an enquiry using our online enquiry form and we will be in touch when it is convenient for you. 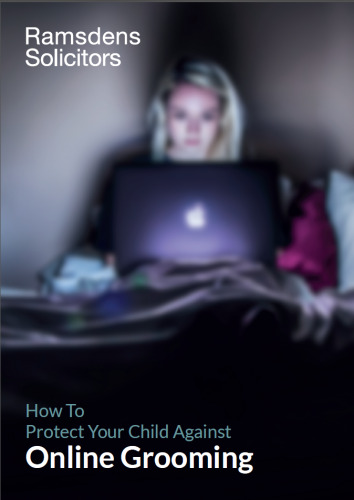 We have put together a helpful guide on how to protect your child against online grooming.